At the bottom of Microsoft Word application, we locate the Status Bar where we just do a right click on it. Once we do the right click, a shortcut menu appears named Customize Status Bar as shown in the image below. On the Customize Status Bar appear many commands where we can activate or deactivate. All we have to do is to click on the command that we want, and it will be activated or deactivated. If we activate it, it will appear on the Status Bar. If we deactivate it, it will no longer appear on the Status Bar. For this post, I have activated the Page Number, the Word Count, the Character Count (with spaces) and the Language commands. We notice the check marks located at the right of the commands. 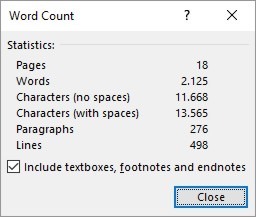 In the image below, we can see how many Page Numbers we have in our Document, how many Words and how many Characters (including spaces) in our Document. We also have available the Language that we are using in the Document. This way we can keep track of the Word Count in our Document and to make sure that we are reaching our goal. At any time we can have a quick glimpse at the Status Bar to count our Words, Characters and Pages in order to find out if we have reached our goal. If we press from the Status Bar the command Page, the Navigation Pane will appear, so we can easily navigate in our Document. 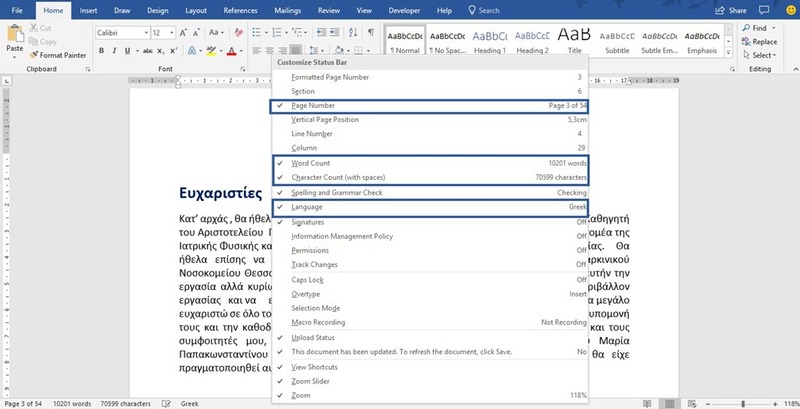 Below you can check out the video describing how to Customize the Status Bar in order to Count Word, Characters and Page Numbers in a Word Document. 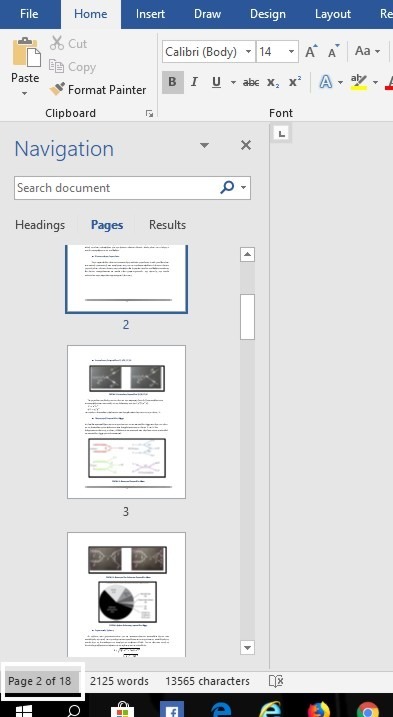 Posted on March 26, 2018, in Microsoft Office 365 ProPlus English, Word 365 English and tagged Character Count, Characters and Page Numbers in a Word Document, Count, Customize the Status Bar in order to Count Word, Document, Language, Microsoft Office, Microsoft Word, Office Smart, Office System, Page Number, philippospan, Smart Office, Status Bar, Subscribe, Word Count, Words. Bookmark the permalink. Comments Off on Customize the Status Bar in order to Count Words, Characters and Page Numbers in a Word Document.